Thermocouple Temperature Switch offers a wide temperature range, two selectable alarm set, and an internal buzzer indicating alarm condition or error. Includes a fitting clip for panel mounting and instruction manual. 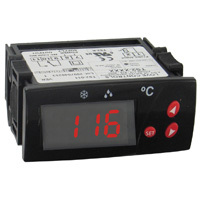 Digital Temperature Switch monitors and controls temperature for cooling and heating. Offers twelve programmable functions to customize. Applications include chillers and medical sterilizers or equipment. 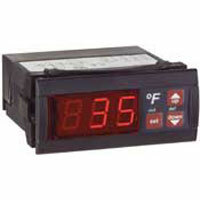 Digital Temperature Switch has easy programming and a bright red 3-digit LED display. Includes a thermistor with a five foot cable, fittings clips for panel mounting, rear terminal cover, and instruction manual. 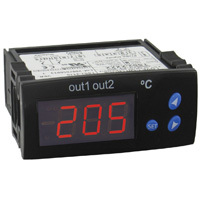 Dual Stage Temperature Switch features two independent sensor inputs and control outputs. Applications include refrigerators, chillers, food service equipment, and medical sterilizers or equipment. Digital Temperature/Water Level Switch has a high and low set point in order to control water temperature. Applications include wood or pellet boilers. 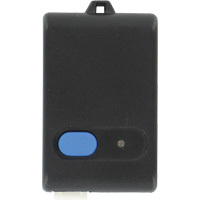 Digital Temperature Switch Configuration Key allows users to quickly program multiple controllers without external power. The integral connector plugs directly into digital temperature switch. Digital Temperature Switch is the ideal control for on/off heating or cooling applications. Applications include refrigerators, chillers, food service equipment, and medical sterilizers or equipment. Digital Refrigeration Temperature Switch is designed for controlling the compressor, fan, and defrost in refrigeration applications. Contains a built-in real time clock. 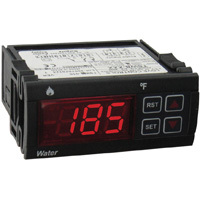 Digital Temperature Switch accepts a variety of inputs to allow temperature measurements. 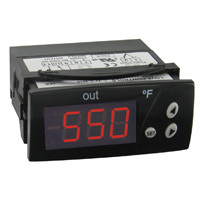 A flashing alarm informs users when the current temperature exceeds preset limits. Weatherproof Digital Temperature Switch includes one PTC thermistor probe. Applications include chillers, walk in coolers, wood boilers, and brewing systems. Digital Dispensing Temperature Control monitors and controls product temperature and dispensing rate in the production of melted cheese, chili, or other heated food products.